ASC removed the roof with a plasma cutter and in its place installed a Mike Alexander-engineered retractable SMC (sheet-molded-compound) hardtop assembly which was operated by two computer controlled hydraulic cylinders located in the trunk. It took a short 35 seconds to completely lower the top whose computer included software that halted the operation if the top met a foreign object such as a human head, hand, golf club or piece of luggage. The SMC top, tonneau cover and its related hydraulic and electrical components added 280lbs to the weight of a FWD 3000 GT coupe and was significantly lighter and simpler than the system used by Mercedes-Benz on their SL roadster. The 3000 GT was available in both front-wheel-drive and Mitsubishi’s VR4 all-wheel-drive system, and when fully optioned stickered for $65,000. Keeping all of the electrical and mechanical components working properly has become a big challenge for Spyder owners as the cars are nearing their 18th anniversary. 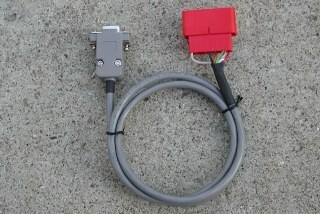 Through the Yahoo 3000 Spyders Group, solutions have been found for many unique problems and the group remains committed to helping Spyder owners diagnose and repair problems with the ASC designed system. 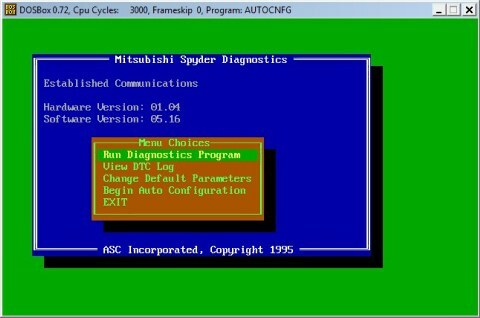 Part of that commitment has been in contacting ASC and locating the original software executables and PC user manual for the diagnostic program which was designed for Mitsubishi Dealers. As the cars age, however, the number of dealers qualified and able to support diagnostics is probably diminishing as well. The Spyder community need not worry as all of the software and hardware to perform the task was located by group members. The only problem is that the software was designed for MS-DOS computers which haven't been sold in many years. Also the only source for the RS-232 to ISO9141 converter was Silicon Engines, an engineering services company. A modern solution to these problems has been available from 2009 through JNS Engineering. 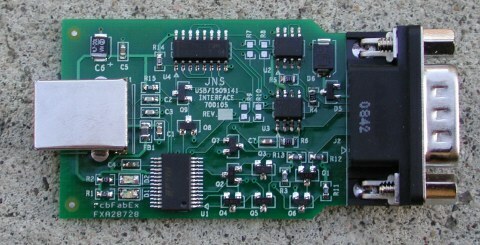 The JNS USB<>ISO9141 converter module replaces the Silicon Engines box and also provides a USB interface to todays computers. A windows installer for the USB<>ISO9141 converter automatically loads USB drivers as well as the original ASC executables. 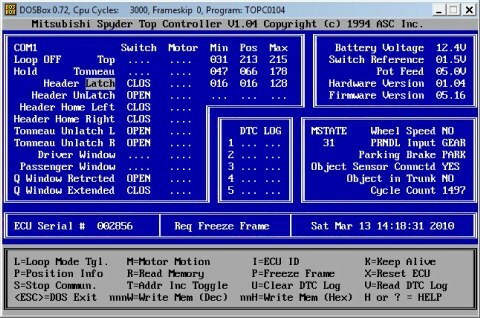 A DOS emulator, DOSbox is also installed and configured to automatically run the ASC program with a double click of the ASC icon. The installer supports Windows 8, Windows 7, Vista and XP in both 32 and 64 bit versions. Spyder Top Calibration in the comfort of your own garage!! 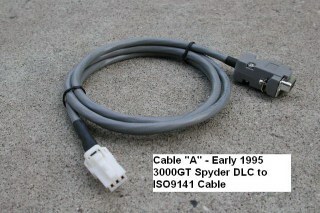 Unfortunately the connector on the vehicle side of the cable can be either a male or female Yazaki connector depending on when the Spyder was produced. 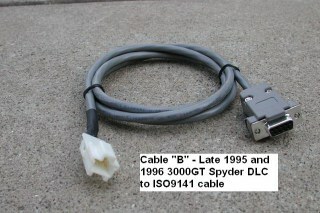 For clarity we will define Cable A for the male Yazaki connector that interfaces with the early 1995 Spyders, and Cable B for the female Yazaki connector that interfaces with late 1995 and early 1996 Spyders. 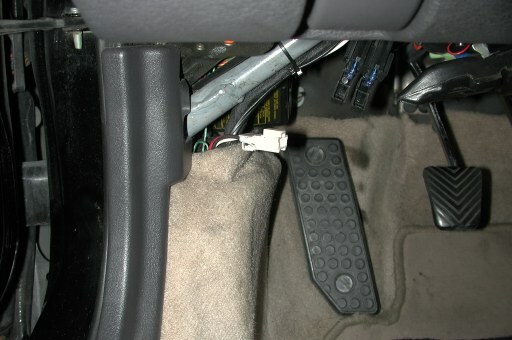 The DLC in the vehicle is located behind the carpet at the base of the cowl near the floor. Sometimes the cable is deep under the carpet so you might have to remove the trim piece to expose the cable.. 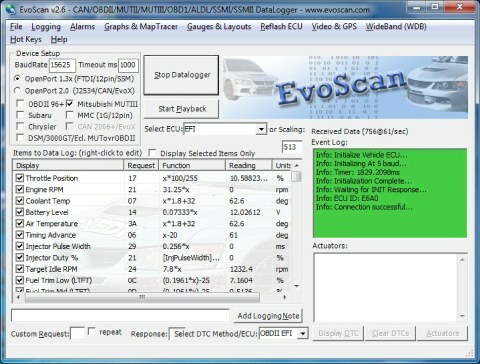 The Top_Link Converter Module supports Evoscan software for engine diagnostics using the optional OBD II Cable described in the Top_Link manual. The optional cable can be purchased from JNS Engineering or, if you prefer, you can build your own cable as the parts are called out in the Top_Link manual. With the latest v2.9 Evoscan version you will be able to diagnose CELs. 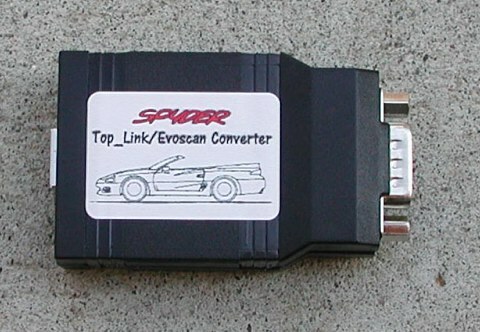 Evoscan software is NOT included when purchasing the JNS Top_Link converter. Please visit http://www.evoscan.com to register and download the software for $25US. TopLink now comes with both Type "A" and Type "B" cables so you can always be sure your Spyder can be connected. For more information, please review the Top_Link manual. Please note that the manual is included in the Top_Link Installer.